Had a very plesant few days here but moved on before the place became to crowded with it being a B/Holiday w`end. Had a nice ride into Tring via the Wendover arm and as it was market day and sunny it was quite busy. The local auction rooms were open for pre- auction viewing so i had a nose around. Seemed to be full of all the sort of junk i had when trapped inside a house. If you want a good way to clear your junk just buy a boat. The end result is no clutter and FREEDOM. 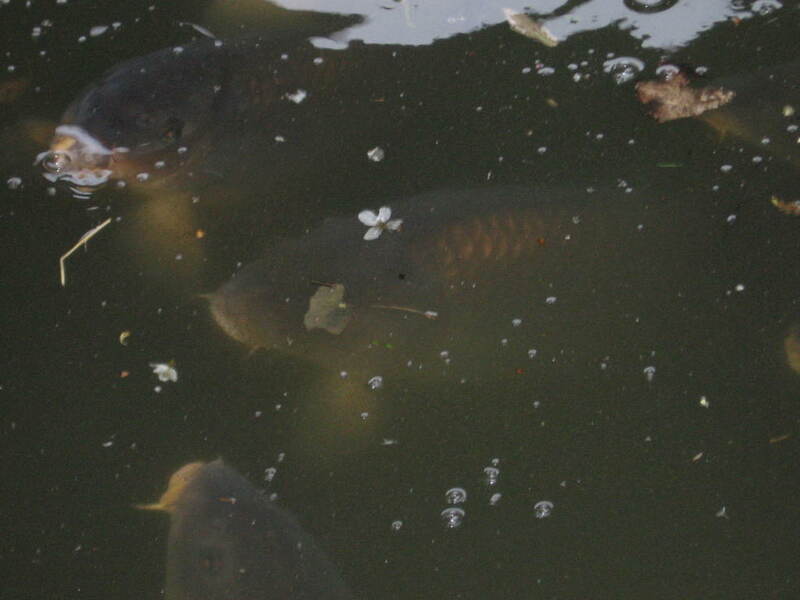 Passing through Hemel Hempstead i decided to stop the night at Winkwell where the boat was fitted out. After a good nights sleep, needed after solo locking all day i popped into the boat yard and had a chat with Phil who had done the fit out on my boat. He is at present fitting out a boat for a New Zealand couple who intend cruising summers here and returning home to avoid our winter. Phil is working to a very tight schedule as the couple fly in 14 days from now but he says all will be well. I wished him good luck and drifted off to Berkhampstead for a lunch stop and a browse in the bookshops for some more reading matter. A night stop at Cow Roast and a walk in the morning produced my Swan picture. 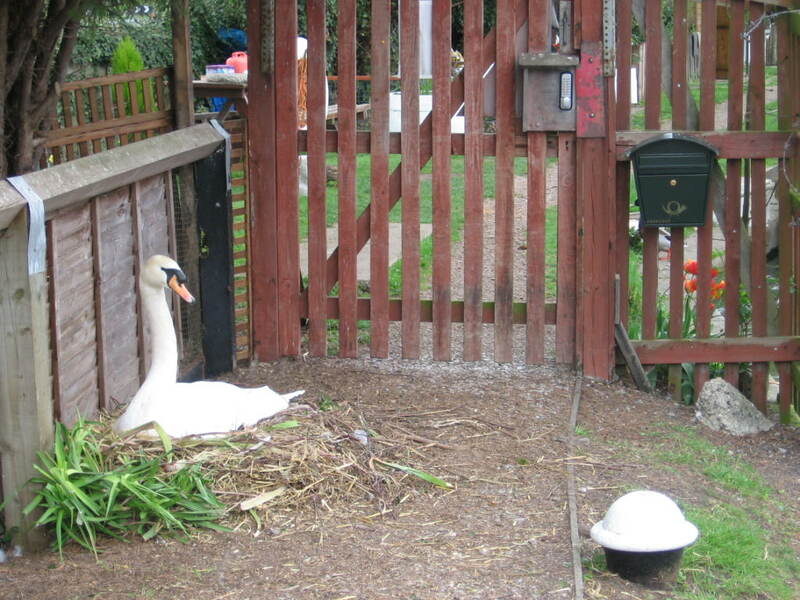 She had decided to nest right in front of the entrance to the offside permanent moorings. The result was the fence of the lockeepers cottage was removed so that a new entrance could be made to the moorings. The seat was fitted somewhere along the way between croxley grn and cow roast, can`t remember exact location but hey who cares, this wonderful carefree life is to enjoy not worry about time and place. Have moved on but more next time. 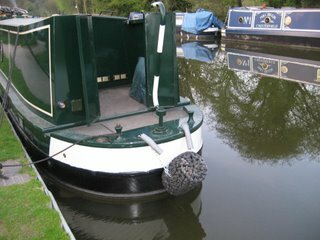 I left Bulls Brdg about lunchtime thursday intending to stop at uxbridge but was so relaxed standing at the tiller chatting at the locks that i filled the tank at Uxbridge boat centre (52p litre,70litres filled it up) and just kept going. Upon reaching Rickmansworth it was getting near dusk but i decided to carry on to croxley green as i had made some friends on the winter and permanent moorings. I ended up mooring at 9.10 pm. Spent Friday visiting 2 of my grandchildren and ended up helping my son with some DIY, still i did enjoy it. Awakening saturday to such a sunny warm day i decided to get the paint i had bought at uxbridge and personalise the boat. It was a bit plain all green apart from the cream coachline on the sides. Spent time between coats making up a seat for the f`ward deck but this is not ready for fitting yet so you will have to wait for a pic. 1st time i have seen BW in a patrol boat. 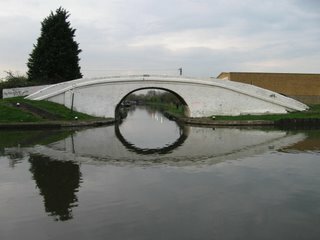 The picture was taken at Bulls Bridge after my return from a trip down the Paddington arm. He took a good long look at all the boats moored on the Tesco moorings then reversed up past me and 2 others moored just along the wall past the old dry dock and then off he went down the Paddington arm. 1st time today i spotted a turtle climbing out of the canal via an old tree stump. 1st time today a parakeet landed in a tree at Greenford just as i passed by. 1st time i have ended up in the cut, yes ha! ha! ok after i had showered and got the washing machine going and sat with a cuppa i did laugh. Settle down i want to tell you a story. Once upon a new life on my boat i travelled from Bulls Bridge down the paddington arm to visit some workmates and upon arriving at Acton a bit wet from the rain i picked my mooring and came to a stop now as it had been raining i was wearing a long coat that was almost knee length and as i turned to pick up the rope that naughty boat decided to drift out just a bit, no problem just a small jump could normaly jump twice the gap...........BUT i had forgotten the coat my legs just would not part enough and so had no choice but to step into the water up to my waist. I was out quicker than i went in. 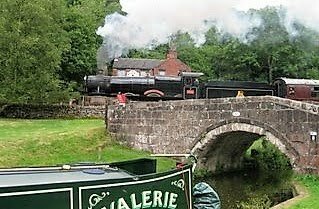 Anyway the visit was a success lots of people came to visit and i am now back at Bulls Bridge and will be heading north tomorrow. Have been watching the fuel guage because after my van driving days i can`t believe it still shows so much fuel left. 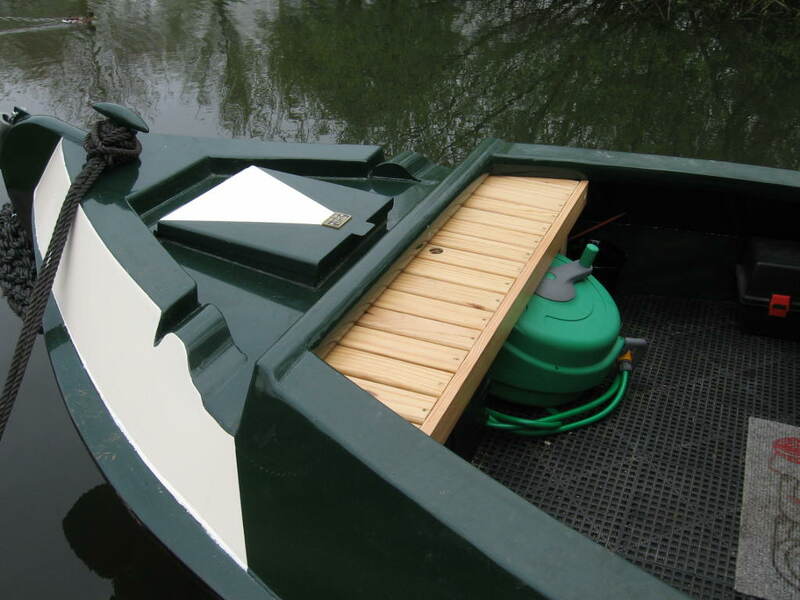 Very economical these boat engines but then again i never go above 70 on the straights. Left Rickmansworth lunchtime on Good Friday and arrived at Uxbridge early evening after a very lesurly cruise inc a wait at a water point of one hour but as it was next to a lock(coppermill) it gave me the opportunity to talk to so many of the people passing through taking advantage of the long w`end mostly but a couple were like me liveaboards. It was such a nice sunny afternoon i actually took off my jumper and had a very nice half hour on the front deck eating lunch. Spent Saturday topping up the batteries and checking oil levels and made a roof rack to go on the roof to hold my bags of coal and logs and also the bike, it does make the top more tidy. Also on sat. i walked into Uxbridge town and bought myself a new duvet then popped into Uxbridge Boat centre to get a new fuel filter but was out of luck. 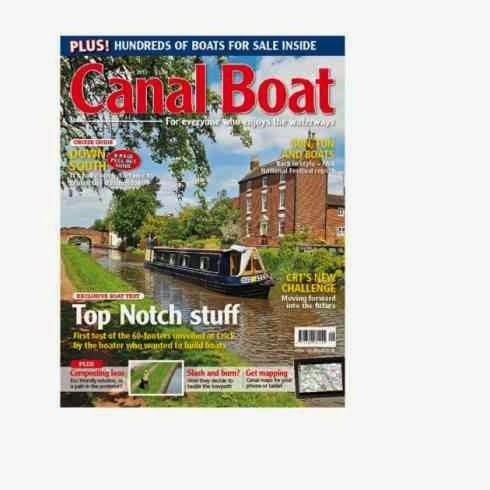 Anyway while looking around this truly remarkable chandlery --how they fit so much into a small space beats me-- i spotted some paint that gave me the idea to personalise my floating home, more on this when i get around to doing it. Caste off sunday afternoon shared my second lock and arrived at Bulls Bridge the junction where the paddington arm branches off. Must remember to turn sharpe left under that white arched bridge t`morrow. Oh and the TV reception here is CRYSTAL clear even channel 5. 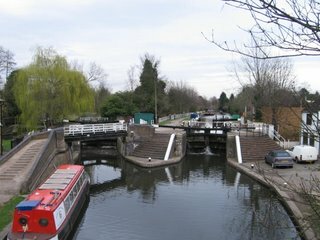 The view in the picture is Batchworth Lock Rickmansworth. 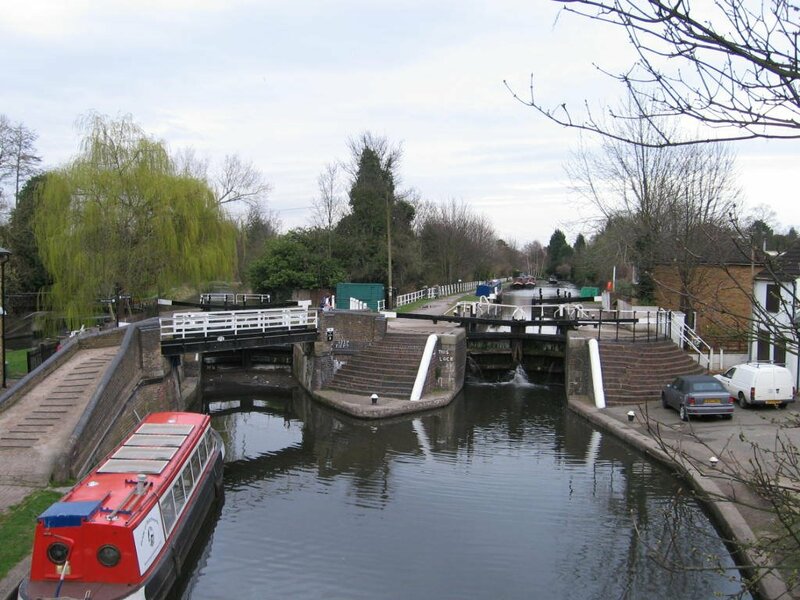 The grand union is via the right hand lock, and to the left just under the footbridge is a set of padlocked lock gates beyond which flows the River Chess. 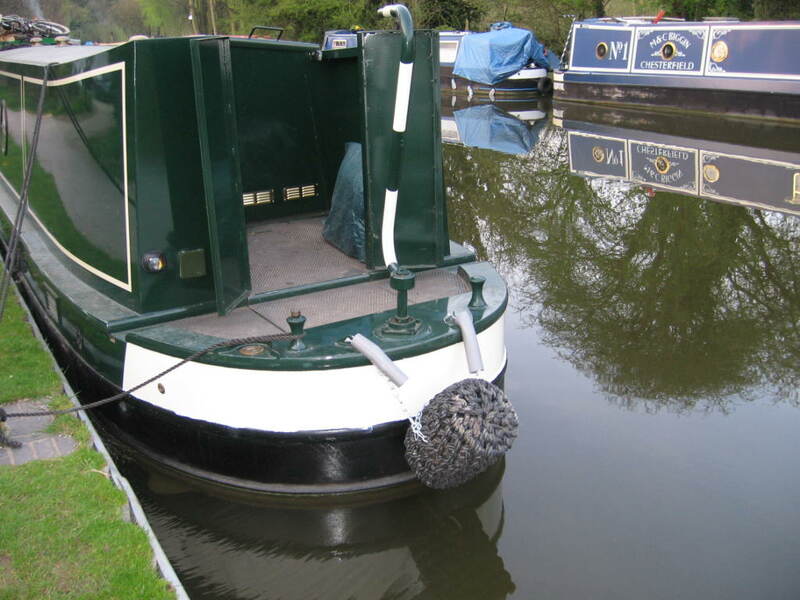 The moorings are very good here with plenty of newly installed rings and a decent towpath surface. 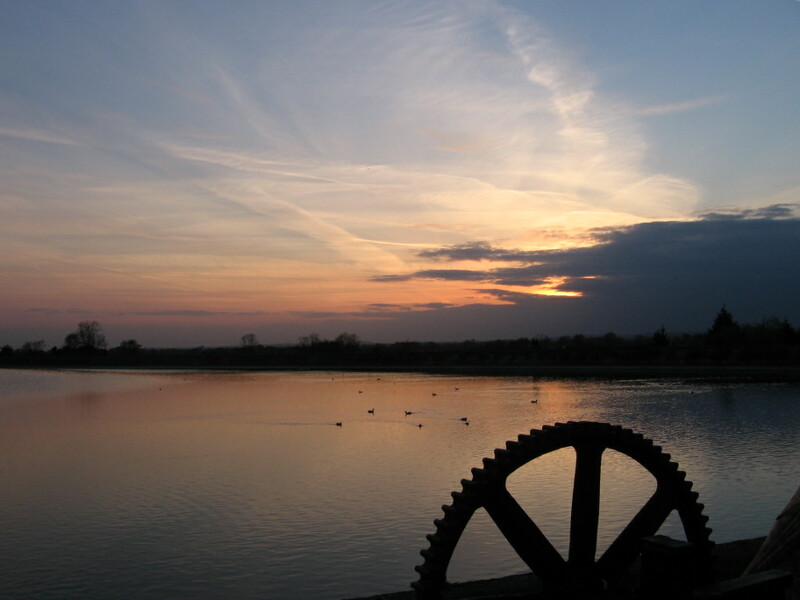 Just 50 yds beyond the moorings lies the aquadrome consisting of to large lakes that is in the process of a very big facelift. A quick look through the gate off the towpath shows lots of tree cutting and a bridge under construction, will walk around tomorrow. 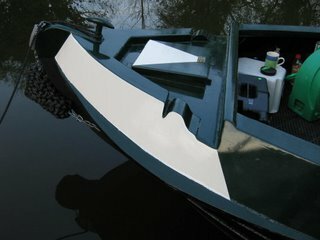 Just before mooring i used the BW services emptying my toilet cassettes and clearing the front deck of my rubbish. Someone had decided to bin a folding bike-gold dust to a boater- so out it came and half hour of TLC the tyres inflated and gear change adjusted, a bit of oil here and there and i now have a 3 speed folding bike. Now as i already have one on board it will have to be found a new home!! Sitting looking at the Nicholsons map i think i will have my work cut out to stick to my plan as previously mentioned, the problem being i forgot all about the easter break (thats what it`s like this life -no concept of time) so this means after visiting ex workmates i will not be turning back till wednesday after easter. Just have to see how it goes. Feeling shattered after not moving so long and then 4 locks so early to bed and up early ish ish to walk round the lake. Must keep exercising must keep as fit as i am after 20 yrs of jumping in and out of a van 60-70 times a day. To think i could still be doing it now if i didn`t make this "change your life Les its the only one you get" decision. Early days yet but i am convinced it was a good move. 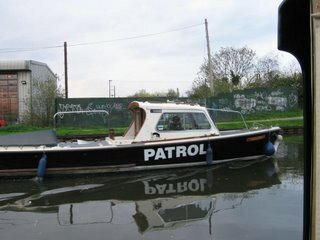 Well it`s been a while since the last blog and since arriving at croxley near Watford the boat has not moved an inch. There have been several reasons for a continuose cruiser not to cruise, the main one being that Sue and i have parted company. Several times i intended to move on, not to far as i helped my son move, but just could not find the motivation. Anyway today i decided was the day and a move on to Rickmansworth was planned but the heavens opened and i do not do rain cruising. Tomorrow will do, after all this is a lifetime cruise not a 2 week holiday. Plan is to go down to Wembley area and visit some workmates and show them the boat then turn back heading towards Gayton and meet up with friends. This might mean some long cruising days being single handed but i am now in the frame of mind to get on with life. While i have been here have had a good walk around the nearby cassiobury park that skirts the canal and was amazed to see a number of pathways have been created through the woods at the edge of the park. I say amazed because i lived in watford some 25 years ago and it certainly was not so pleasent to walk along the canal and the gade with new footbridges created. Well done Watford council. If you come this way stop off between cassio bridge lock 78 and bridge 168. Walk over 168 follow 1st path on left and if you see the fox i have bumped into twice mid-afternoon just say sorry LES sent us. 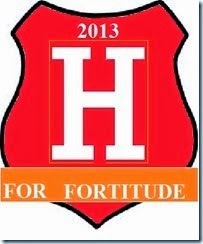 Right now i have started blogging again will try to keep upto date.